A deployer mechanism attached to the outside of the Japanese Kibo lab module ejects a CubeSat into Earth orbit. An experimental module attached to the International Space Station is being prepared for upcoming cargo operations. Tiny research satellites were also ejected from the orbital lab while a pair of Expedition 53 crew members scanned their leg muscles today. BEAM, officially called the Bigelow Expandable Activity Module, is being outfitted this week for future stowage operations. Excess gear, including inflation tanks and dynamic sensors, used during its initial expansion back in May of 2016 is being removed to make room for new cargo. BEAM’s old gear and trash will now be stowed in the Cygnus resupply craft for disposal early next month. The Kibo lab module from the Japan Aerospace Exploration Agency was the site for the deployment of several CubeSats Monday morning. 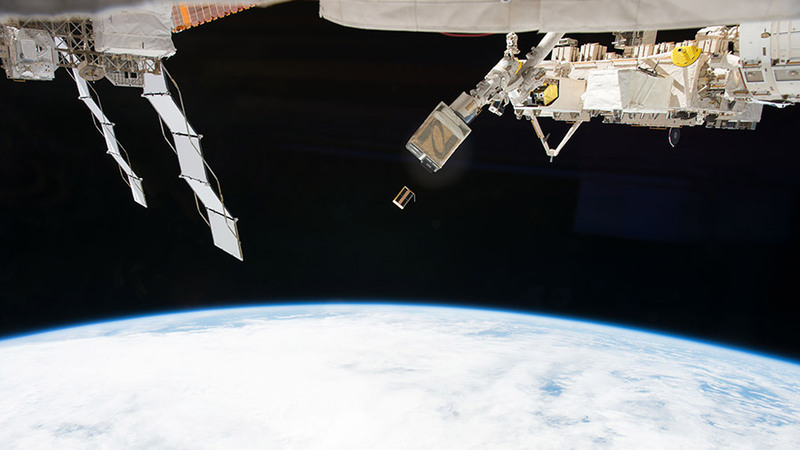 A mechanism attached to the outside of Kibo ejected the CubeSats that will orbit Earth and provide insights into antibiotic resistance, astrophysics and “space weather.” More CubeSats will be deployed Tuesday. Flight Engineers Paolo Nespoli and Sergey Ryazanskiy spent Monday exploring how the lack of gravity affects leg muscles. Nespoli strapped himself into a specialized exercise chair and attached electrodes to his leg with assistance from Ryazanskiy. The Sarcolab-3 experiment uses measurements from an ultrasound device and magnetic resonance imaging to observe impacts to the muscles and tendons of a crew member.